As court painter to both Charles III and Charles IV of Spain, Goya achieved considerable fame as a portraitist. Self-Portrait with Dr. Arrieta, the last of his many self-portraits, was executed late in his life. In 1819, Goya had fallen seriously ill and his doctor, Eugenio Garc’a Arrieta, nursed him back to health. On recovering, he presented Arrieta with this painting which shows the physician ministering to his patient. 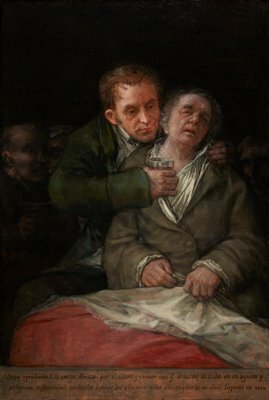 The words at the bottom read in translation, Goya gives thanks to his friend Arrieta for the expert care with which he saved his life from an acute and dangerous illness which he suffered at the close of the year 1819 when he was seventy-three years old. He painted it in 1820. This inscription gives the canvas the look of an ex-voto, a type of religious painting still popular in Spain, which expresses gratitude for deliverance from a calamity.